It is widely held that the financial crisis starting in 2007 and reaching its lowest point in October 2008 was caused by insufficient government regulation of financial markets. However, some financial experts argue that even if statutory regulation failed and even if market participants took more risks than they should have done, government intervention may have made matters worse rather than better. One of those experts, Professor Philip Booth, will give a lecture at the University of Iceland Wednesday 13 March, 12–13, on “The Real Causes of the Financial Crisis”. The lecture (which will be in English) will be in the Natural Sciences House, Askja, Hall N–132. It is organised by the Department of Business Administration at the University of Iceland in cooperation with RNH. Admission is free. Professor Ingjaldur Hannibalsson, President of the Department of Business Administration at the University of Iceland, will chair the meeting. Philip Booth is Professor of Insurance and Risk Management at Cass Business School at City University of London, where he has taught many Icelandic students. He has also worked at the Bank of England, as a special advisor (1999–2002), and is currently the Editorial and Programme Director at the Institute of Economic Affairs, IEA. He was a Fellow at Blackfriars Hall, University of Oxford, 2010–2011. He is editor of Economic Affairs, and Assistant Editor of the Journal of Property Research. 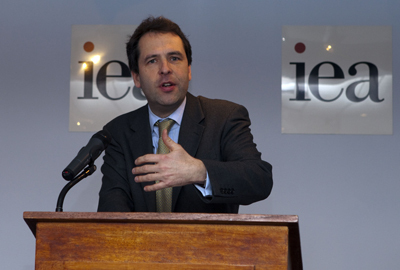 In 2009, Professor Booth edited a book published by the IEA, Verdict on the Crash: Causes and Policy Implications. Professor Booth’s lecture in Iceland is a part of the lecture series jointly sponsored by RNH and AECR, the Alliance of European Conservatives and Reformists, on “Europe, Iceland, and the Future of Capitalism”. Forthcoming lectures in the series include: Tuesday 30 April 2013, 12–13, Dr. Steven Gjerstad who is doing research with Nobel Laureate Vernon Smith on the reactions of various countries, including Finland and Iceland, to the international financial crisis, will speak on his research subject. His lecture will be in Hall 102 in Gimli at the University of Iceland.